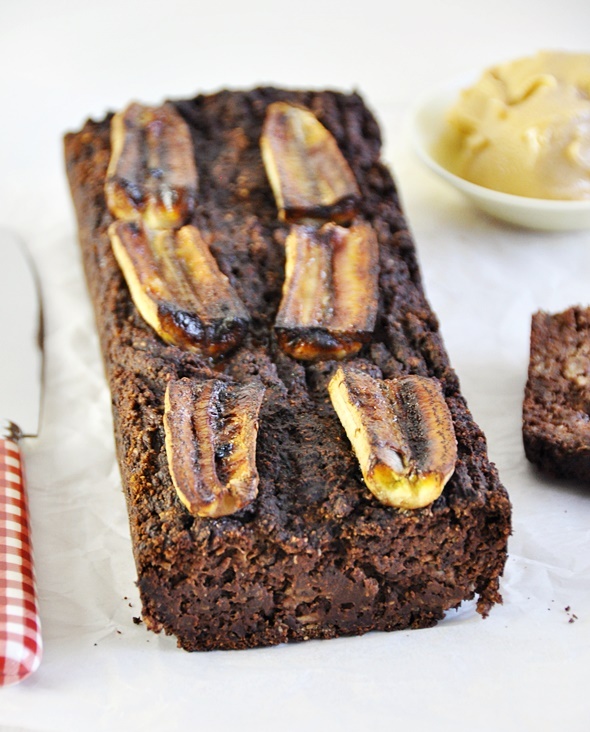 I thought what a brilliant idea to give a flourless banana bread a go! So here it is, Felicia, my take on flourless banana bread – with almond meal with raw cacao powder. I did not add any sugar to the loaf except for a light sprinkling of coconut sugar on top of the banana toppings to help with the caramelisation. Ooooo, caramelised bananas, can’t say no to that hey? Let me tell you the textural difference of this flourless banana bread as compared to the spelt version. It is definitely denser and more crumbly. Plus the flourless version takes 20 minutes longer to bake, thus making the total baking time of about an hour. So my dear friends, this may be the baking recipe for you this weekend. Let me know how did the loaf turn out for you. To make an egg substitute, mix the chia seeds and water and allow it to sit for 15-20 minutes until it transforms into gel. Preheat the oven to 180C. 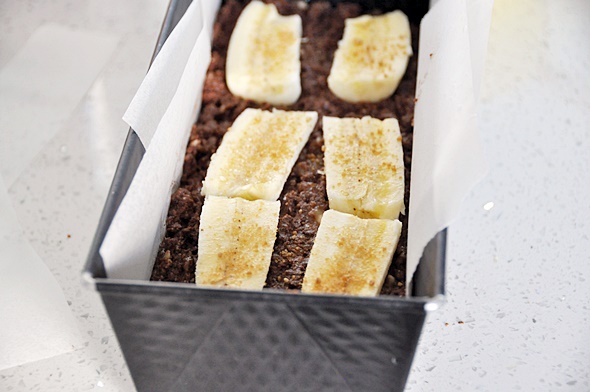 Line a loaf tin with baking paper or lightly grease it with some flavourless cooking oil. Mash 4 bananas, add the chia seeds gel. Whisk with a fork until well combine. 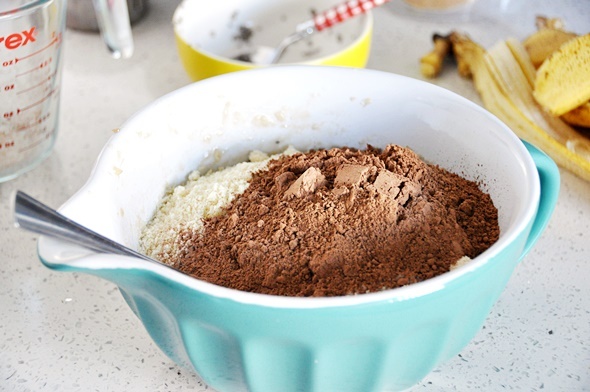 Stir in almond meal, cacoa powder and baking powder until well combined. Transfer the batter to the loaf tin. Smooth the surface to make sure they are evenly distributed. For the toppings, add banana slices and a light sprinkling of coconut sugar. Bake in the preheated oven for about an hour or until the cake tester come out clean. Cut them into slices and slather with almond/peanut butter. You will need a loaf tin. Wow! How cool that my question in your previous post ended up as an idea for a new recipe! Thanks for trying out this recipe and testing it on our behalf!! so honored!!! Happy weekend dear! 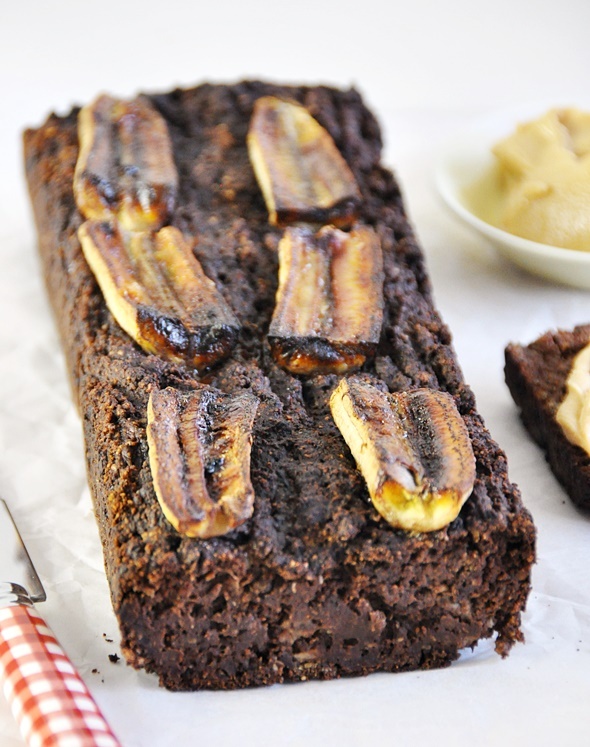 I cannot wait for bananas to ripen so that I may try this recipe!